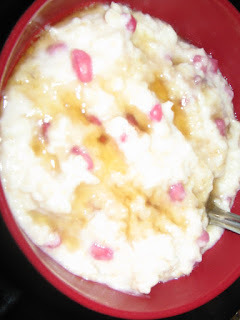 Boil milk in a pan,and after they start boiling add oats and let it boil.The oats will be cooked soft,now switch off the stove.Now place dates,raisins,badam and pomogranate seeds in a bowl.Then add the cooked oats n milk mixture,and honey and mix well.Serve hot or lightly freezed. A healthy food for elders and also children. So colorful..healthy n delicious..good one! !